Chef Ron Guidone is the longtime proprietor of Mangiamo Restaurant, in Manhattan Beach, California, and in 2014, he took the 5-Day DRSB Workshop with Brian Bomeisler. Brian writes: “In November 2014, Chef Ron took our Drawing on the Right Side of the Brain workshop at the beautiful Grand Colonial Hotel in La Jolla. He was not only a dedicated and fun student but he was also an accomplished chef AND artist! 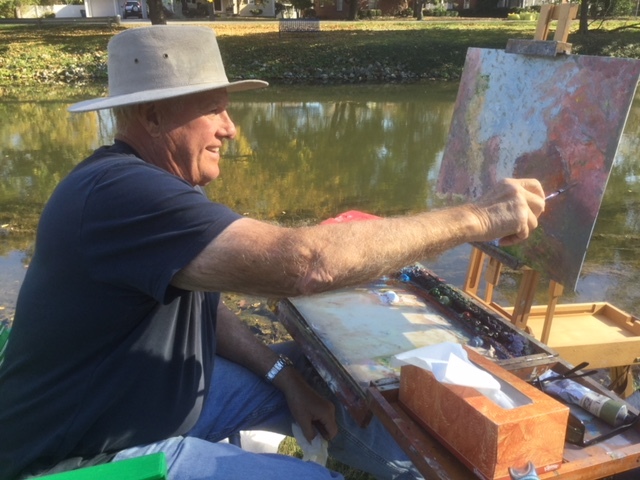 He shared many of his beautiful paintings with me and the group, who were all impressed with his talent. Ron did exceptionally well in the drawing workshop along with sharing many of his restaurant anecdotes during our lunch breaks!” Read more about Chef Guidone in this article, and in this profile on his restaurant’s website. We are proud of all our students, artists in the studio and in the kitchen!